We now offer thermal imaging cameras for on-site professional use, inspection of installations or machines, and security. Thermal imaging cameras are improving the knowledge regarding infrared measurements. Our new models are smaller, easier to use and more economical. The PCE-TC series are the new generation of thermal imaging cameras. Their small design allows for complete portability. You don't need to be an expert to capture infrared images. The possible uses of these thermal imaging cameras is extensive. In addition to inspection and industrial maintenance, thermal imaging cameras are a tool of interest for builders and architects. They also help investigators to determine infrared characteristics of various components. At manufacturing facilities thermal imaging cameras are used for inspecting a countless number of production equipment and components as well as the complete electrical power supply system. Thermal imaging cameras are reliable non contact instruments which are able to scan and visualize the temperature distribution of entire surfaces of machinery and electrical equipment quickly and accurately. Infrared thermography with our thermal imaging cameras is the easiest and quickest method to detect energy waste, moisture and electrical issues in buildings. Thermal imaging cameras shows exactly where the problems are and helps focus the inspectors' attention allowing him or her to properly diagnose areas with energy loss. Poor or inadequate insulation, moisture, building envelope leaks, and substandard work are costly to residential and commercial building owners. 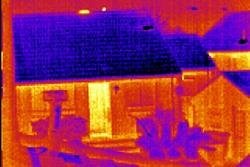 Thermal imaging cameras can help you quickly see where energy efficiency can be improved. 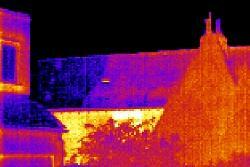 Thermal imaging cameras make it easy to improve energy efficiency and locate repairs with minimal disruption. 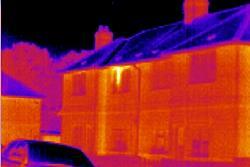 Thermal imaging cameras can help find the sources of trouble with minimal impact to people and buildings. Our thermal imaging cameras are preferred by building experts for fast, reliable, accurate building diagnosis in the entire range of building problems. If you don't find the thermal imaging cameras you are looking for, please contact us on: UK customers +44(0) 23 809 870 30 / US customers (561) 320-9162 and our technical staff will advise you regarding our products. Our engineers and technicians will be happy to help you with the thermal imaging cameras, and of course, with the other products in the field of regulation and control, and scales and balances. Infrared measurement consists of capturing an image to make visible the heat radiation from an object, invisible to the human eye. This measurement doesn't require contact with the device and the camera can record events such as explosions, fires and the course of movements. Infrared measurements can be recorded to produce a scheme of temperature measurements of an area. Infrared images illustrate the heat emitted by objects, machines, buildings, etc. Thanks to thermal imaging you can have an idea about the loss of infrared heat or determine heat sources. 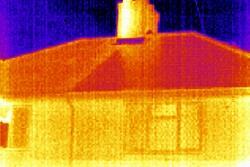 To guarantee quality, thermal imaging is becoming more frequent as in installing insulation during the construction of a building. This allows to locate problems without causing damage to the building. Our thermal cameras are suitable for these situations. Thermal imaging cameras provide us with a thermogram, a representation in color of radiation differences in objects. 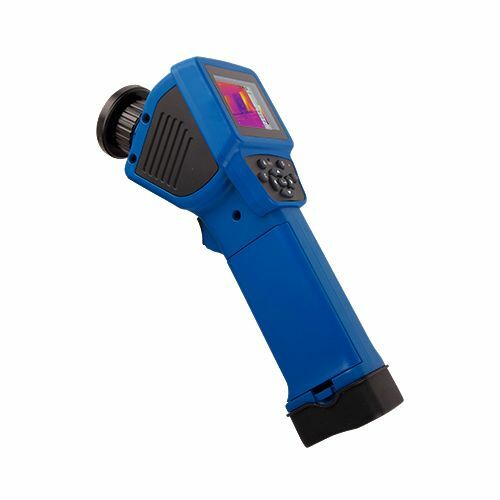 Since infrared radiation is a parameter related to temperature, a thermal inspection is used to discover differences in materials temperature. This allows for the thermal imaging cameras to be used in diverse fields, for instance in a building, because both heat loss and isolation are key elements for a building efficiency and comfort. This type of thermal imaging cameras may be of interest to builders, architects, consultants, promoters, management. With a thermal imaging camera you can check heat loss in houses caused by air infiltrations through junctions between roofs and walls. Thermal imaging cameras can be also used to detect humidity and damages caused by water, such air humidity on a roof caused by a leak. Thermal properties of water enables to detect humidity by thermal imaging cameras under certain conditions. 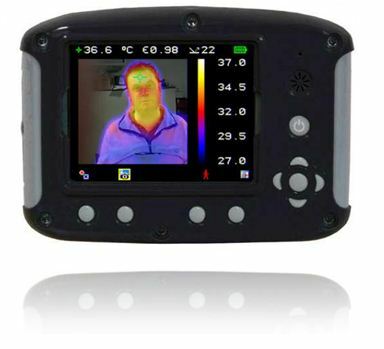 Thermal imaging cameras can be used in various fields (checking roofing and coating status, calculation of thermal transmission in surfaces, inspection of dry processes in materials, heating and cooling systems operation, domestic electrical risk assessment) and in applications where the differences of temperature provide important information. Thermal imaging camera checking isolation of a house. Thermal imaging camera checking isolation at the front of a house. The PCE-TC 3D series thermal imaging cameras are especially good at detecting patients with fever. These thermal imaging cameras can measure the body temperature. Also in the field of medicine experiments thermal imaging cameras are used. With these thermal imaging cameras, inflammations and other anomalies can be detected measuring the temperature of a particular area of the body to make them visible to the doctor and patient. When winter arrives, it increases the transmission of influenza in some places with a lot of people such as airports, transit stations, supermarkets, etc. One of the most characteristic symptoms of influenza is high fever. In some U.S. airports, thermal imaging cameras are used to check passengers to discover if they suffer any symptom of the virus H1N1 as well as other diseases. These thermal imaging cameras can detect fever without any contact. Thermal imaging cameras are like normal cameras but they can register light reflected by an object. Thermal imaging cameras are heat sensitive devices which show images depending on their temperature, so thermal imaging cameras are especially useful in dark environments. Thermal imaging cameras display objects depending on their temperature, hotter objects are brighter. Thermal imaging cameras use very sensitive systems which can measure temperatures up to a fraction of a degree. Thermal imaging cameras were firstly used during the Severe Acute Respiratory Syndrome (SARS) in 2002 and 2003 in the airports of Singapore and China. Since then, thermal imaging cameras have been continuously used. Although thermal imaging cameras can detect high body temperature, they cannot detect human swine influenza. Any traveler exposed to any effort (running, carrying excessive weight, drinking alcoholic drinks together with an excessive heat) may present an increase in body temperature. Thermal imaging cameras PCE-TC 3 have a software which allows for the detection of any heat source. With the help of a temperature calibrator and programming it at 38ºC for example, you could check if the thermal imaging camera detects temperature accurately. The software of the thermal imaging cameras emits a visible alarm to the PC when the thermal imaging camera detects a higher level of temperature. This way, a high accuracy is assured. 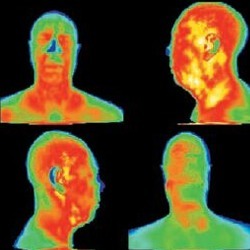 These thermal imaging cameras combine visible and thermal images to create a person’s “heat picture”. With this image you can see a display at the rear of the camera as in the standard digital cameras. A cursor automatically points the hottest area of the image, normally the person’s face. It is better to check people one by one. Thermal imaging cameras are also useful in the field of biology (zoology, entomology, arachnology, ichthyology). On the left, we can see the image of a spider on a person's hand taken by a thermal imaging camera. We observe the difference of temperature between the person and the spider. Blue, lilac and purple colors indicate that temperature is low, while red, yellow and green indicate a higher temperature. Thermal imaging cameras were originally used within the military sector. When the technology of thermal imaging cameras advanced, they started to be used in more fields of application military use, predictive maintenance, control of processes, detection and analysis of fire, inspection of floors, insulation, walls, etc as well as in medicine. Most damages in the industrial sector both electrical or mechanical can be previously detected by changes of temperature by thermal imaging cameras (fixed cameras for continuous control or handheld cameras for spot checks). The use of the thermal imaging cameras in the maintenance of installations, machines, etc makes it possible to detect future damages and avoid their consequences. At purchasing a thermal imaging camera, the customer should take into account: number of pixels, spectral sensitivity, sensor life, field of view, dynamic range, input power, mass and volume. If you wish to view or print a selection of thermal cameras from our catalogue, click the PDF symbol. in Czech Republic in Bulgaria in Polish in Serbian in Russian in Turkish and in Portuguese .